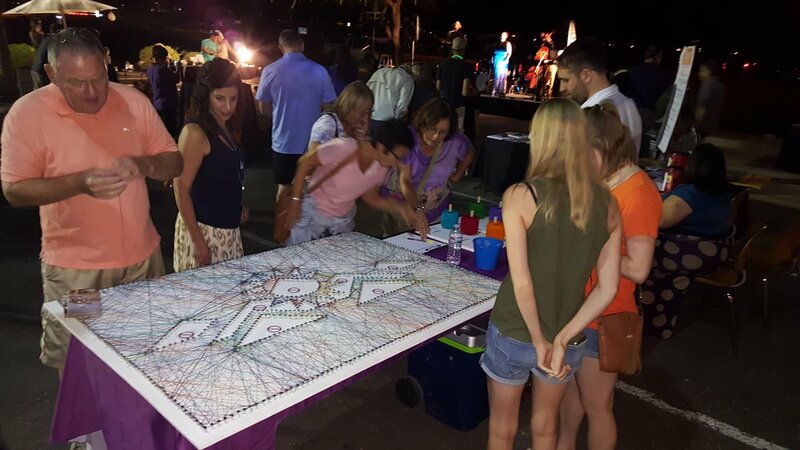 “String Art” – a community art piece, representing participants that gave opinions and feedback on the Arts and Culture Matter Plan, was created during the 2017 Art Week at the “Surprise Block Party” hosted by a local art organization. Photo provided by City of Surprise. The City of Surprise, Arizona has grown rapidly from small town to large city, often on the prospects of the future. Surprise is regularly sought out by visitors and future residents from the southwest and around the country because it’s an active, livable, and prosperous city. Now is the time to ensure the culture of the city and its place in the world. The city is currently in the public hearing/adoption process for its first ever Arts & Cultural Master Plan, implementing a policy outlined in the Arts & Culture Element of the Surprise General Plan 2035. There are two key elements to achieving success for arts and culture in Surprise - reacting to the city that already exists and preparing for the new city that will be built over the next 30 years. Arts and cultural activities can serve as agents of change and growth need not be random or unfocused. The Surprise Arts and Culture Master Plan will help guide the future of public art and investment in cultural amenities; revitalizing neighborhoods, promoting economic prosperity, and giving the community a sense of place. The story of Surprise can be told by public art while its cultural amenities and activities become its calling card to the world. “Bats” – Bat decorating contest for Surprise area elementary schools hosted by the ACA Commission in collaboration with Surprise’s Stadium (home to the Texas Rangers and Kansas City Royals). Photo provided by City of Surprise. Public Art and the current collaboration for amenities and festivals had been a ‘grass roots’ effort in the past with a meager budget allocated out of the General Fund on a year-to-year basis. City leadership recognized that the growth Surprise has been experiencing, and hoping to sustain, needed a larger commitment to this method of placemaking. City Council passed an ordinance One and One-Third Percent for the Art Program. This commits money from qualifying Capital Improvement Plan (CIP) projects into a fund dedicated to the arts and cultural amenities, leading the way for this Arts and Culture Master Plan to guide the use of those funds. Art Is Not Exclusive, Art Is For Everyone! In order to understand Surprise and gauge the needs of its residents, visitors, and the arts community, a series of strategic public engagement events were undertaken that created the foundation for the Arts & Culture Master Plan process. Over a ten-month community outreach, three main stakeholders groups were utilized: city leadership, professionals of the art world, and community members. Each group was necessary and shared a connection in a way that created a unified vision for what was needed and what would likely be supported. A series of open publically advertised stakeholder roundtables targeted business owners and civic-minded members of the arts community to create a clear picture of the wants and needs of the arts community. Establishing those needs generated a survey (available both in print and online) that was then brought (in person) to the greater community through a series of events called “Art Week,” where all the forms and approaches to art were highlighted. The collaborative community brought together a master plan that will grow and change with the trajectory of the community – as will the scale and diversity of artwork and cultural amenities available to the citizens of Surprise. The City of Surprise has an Arts and Cultural Advisory (ACA) Commission whose “mission” is to encourage cultural growth in Surprise and to ensure that art, culture, and entertainment are central elements of the quality of life for Surprise residents. Lacking a department full of resources to engage and grow arts is not an uncommon issue for cities of any size but the ACA Commission championing the cause for the greater community in lieu of staff utilizing an adopted Policies and Procedures manual. The ACA Commission had a ‘hands-on’ approach throughout the entire process of drafting the master plan. They were dedicated to the outreach and communications, the networking with stakeholders, and reviewing the Arts and Culture Plan. This ACA Commission understands the need for this community-driven document to be a true reflection of the vision of city leadership, art professionals, and the greater community. The resulting plan is a positive collaboration between the Arts and Cultural Advisory Commission, city staff, and stakeholders. Joshua Mike serves as the Planner II – Long Range for the City of Surprise, Arizona. He is an urban planner with previous experience working for the Gila River Indian Community Law Office and the City of Mesa, Arizona.